My parents gave me a really nice collage frame for Christmas many, many years ago. It’s hung over my fireplace with select family photos ever since. But one day I decided to mix things up over the hearth and it came down. I tried in vain to find a new place in the house for it to go, but it just didn’t work anywhere horizontally and I didn’t have enough portrait photos to work it. Dejected and a bit upset, I put the frame in the garage. Meanwhile, I’d been trying to figure out a way to organize my very large collection of glasses. I have 12 pairs of sunglasses and 5 pairs of prescription specs and I have long worried about scratching the lenses. I may not have paid much for most of them, but that’s no reason to not take care of them. I had been trying to work out a way involving the method they are displayed at stores, but that made my head hurt. Finally I came to the conclusion that it would be much better and easier to hang them from ribbon attached to something. That something wound up being my long, skinny collage frame. Turns it out was PERFECT for the space that I have on my bathroom wall. So buy a cheap frame or grab one that you love but is currently unused, some cute ribbon, a screwdriver, scissors, ruler and your staple gun and let’s get to it! STEP 1: Remove all hardware from the back of your frame. Remove the picture, frame, glass, etc. I’m not sure that i’ll ever use them, but I saved all of the hardware from the back. You just never know when that will come in handy. 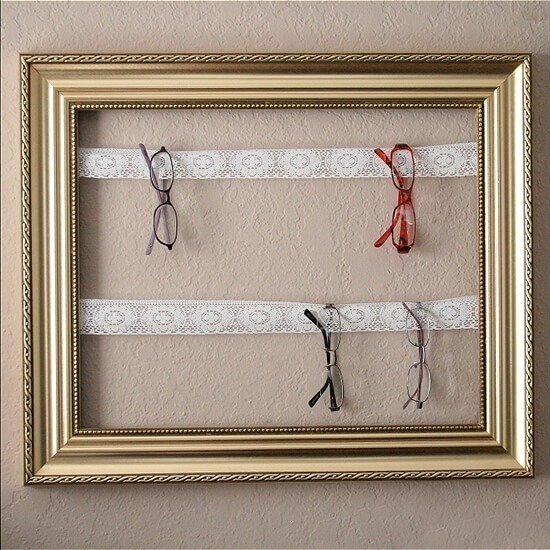 If your frame doesn’t currently have a way to be hung, go ahead and attach your choice of picture hanger. STEP 2: Measure the length of your frame and determine how far to space out your strips of ribbon. Be sure that you will have plenty of room between them as they hang. Use a ruler and draw a straight line across both the left and right back side of the frame. 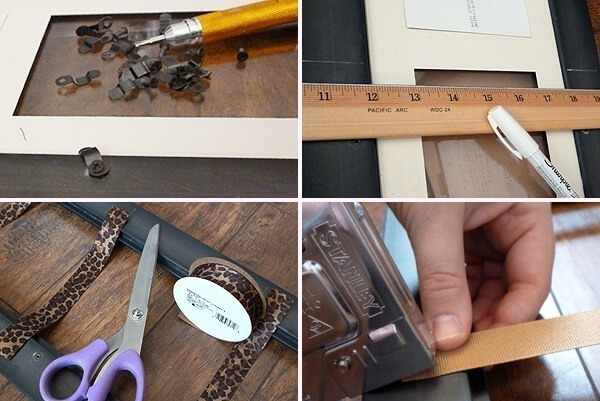 You’ll use this as a guide to attach your ribbon, so the more exact the better the end results. I went ahead and placed a pair of glasses about half an inch below each line, just to double check that it would work out. Skip this if you are more confident about your math skills! STEP 3: Cut your ribbon to length as needed. Be sure that your pretty side is facing away from you and, using your lines you drew as guides, staple the ribbon onto the back side of the frame. One staple per side was more than adequate for my frame. 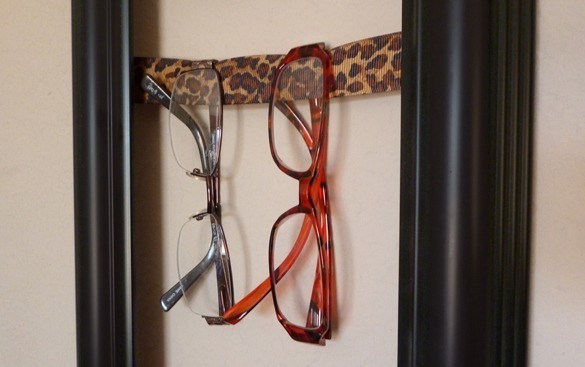 All that is left to do is hang your frame and display all of your pairs of glasses. Now they are easy to find and your set up looks super cute on the wall! My specs organizer has proven incredibly handy for keeping my sunnies together and unscratched. Unfortunately it has been less help with my every day glasses since I mostly wear them in my office. So rather than travel across the house for a pair, I made another holder just for my plain ol’ glasses to hang out. I used a frame I already had and went with lace with some stretch. Now I just need to find the pairs I lost! Cute idea. Did the ribbon stretch after awhile because of the weight of the glasses? Daria – It just noticed yesterday that it is starting to stretch. I plan on tightening up the ribbon and restapling as soon as I can remember to buy more staples! I've been thinking a way to avoid would be maybe to use elastic or stretch lace? It's just what I've been looking for! Thanks for the fantastic idea! No problem, Marybeth. Thanks for taking the time to comment! So cute! My mom bought me a framed mirror, and on ther drive south to see me the mirror broke. I was so upset because it was a beautiful frame so I kept it in the garage. Saw this, and now I know exactly what to do with it! Thank you for the great idea! Thanks for the pin! Adding the keys is brilliant!! Wow you have no idea how happy I am that I found this. It's amazing. Thank you very much! It would also be cute if you upholstered some fabric on the back of the frame! Then your wall wouldn't get scratch up either! 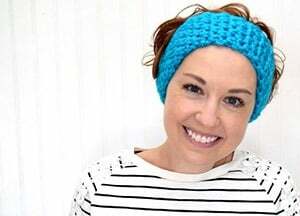 I love the upholstery idea, Missy! Sounds like it is time for a modification!